Soft and cuddly blue teddy bear with personalised ribbon and personalised baby blanket gift set. 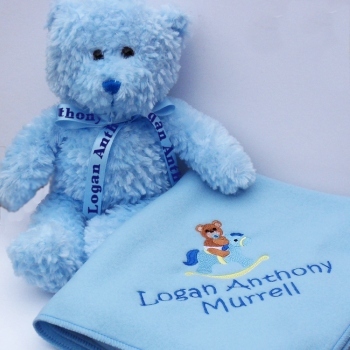 Soft and cuddly blue teddy bear with personalised ribbon and personalised baby blanket gift set. Lovely gift for baby showers and newborns. Custom embroidered blue baby blanket made from good quality 100% polyester non-pil polar fleece fabric. Custom embroidered blue baby blanket made from good quality 100% polyester non-pil polar fleece fabric. We make these blankets to order. A handy pram size of 75x100cm. The edges are overlocked stitched. Please enter the wording or name you would like embroidered on the baby blanket. Select the font style you would like for the text. This is sewn in dark blue thread to coordinate with the teddy bear on a rocking horse motif. The 30cm teddy bear is a soft Mumbles classic teddy in baby blue. 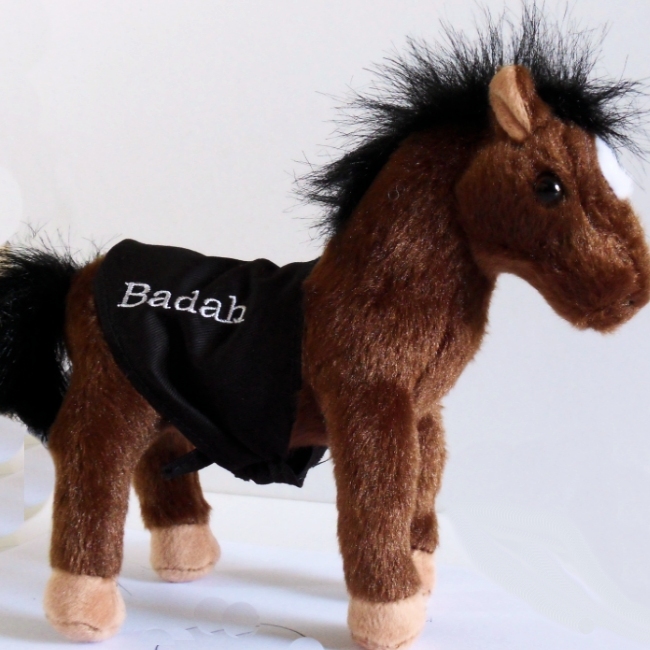 The ribbon is personalised with a name or message of your choice.